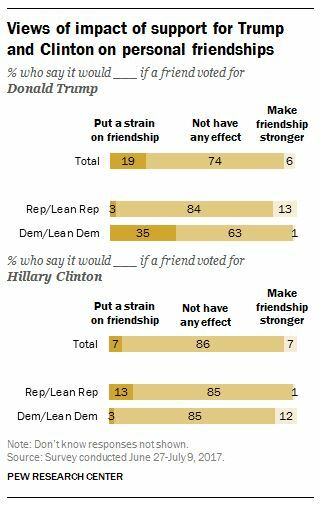 While most people are sensible and mature adults who don’t determine or judge their friendships through a political lens (nearly three quarters of the population actually), minorities on both sides of the spectrum take it all too seriously: while some 13 per cent of Americans who identify as or lean Republican say it would put a strain on friendship if a friend voted for Hillary Clinton, almost three times as many, or 35 per cent of Americans who identify as or lean Democrat say it would put a strain on friendship if a friend voted for Donald Trump. Who are the most intolerant of friends’ political views? White, college educated, left-leaning. In other words, the cultural and the economic elite of the country. So while a sociology professor might struggle to decide whether or not to talk to his Trump-voting golfing buddy, the professor’s minimally schooled Hispanic maid is likely to be only half as bothered (or twice as relaxed) about her friend’s voting choices. 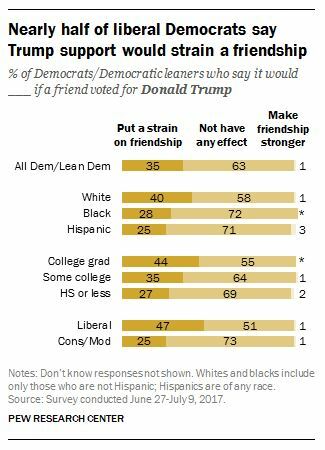 Why such a big disparity in “friendship straining” between the right and the left (13 versus 35 per cent)? Again, I can think of the oft-quoted (including in this blog) old saying: the right thinks the left is wrong, the left thinks the right is evil. This is of course a generalisation, or rather an overgeneralisation, as the research quoted above again suggests. The majority, even of the politically switched-on people, doesn’t think in such crude and Manichean terms. But a significant minority does. If you think that Hillary Clinton is a hopeless candidate you will likely just shrug when your buddies vote for her; if, on the other hand, you think that Donald Trump is Hitler, well, what does it say about the judgment and the moral character of your friend who votes for him? Possibly a fascist him/herself. You should have seen the signs, have you not been too blinded by your twenty years of friendship from the college onward. Just goes to show, you never know someone until they pull that lever and leave a hanging chad. So as part of the 85 per cent of Republicans who don’t care if their friends have voted for Hillary (well, I’m not an American, but if I were one of y’all, I would be), I’m going to do tonight what I recommend we all do: I’m going to hug a leftie and try to make the world a nicer place.